Traditional tunes with a twist. Mozart dances on the bagpipes with the Irish Washerwoman with bass and bongos; a Latin lament, and some cracking jigs and reels from Down Under. Bun' Ber E's Ceilidh: a party in a packet! Toe-tapping traditonal tunes with an irreverent Aussie twist. Perfect for dancing, driving or any celebration. This CD features Bun' Ber E's unique take on traditional Celtic tunes. It features three tracks combining Bagpies with bongos and bass guitar (including a Mozart tune) three songs and four high-energy jigs and reels. Bun' Ber E (taken from Oscar Wilde's Importance of Being Ernest) grew out of the need to provide variety to the Queensland Irish Association's award-winning Pipe Band's concerts in 1996. Two of the pipers and the drum sargent auditioned for a guitarist and formed a four-piece folk band with flute/whistle, keyboards, percussion and guitar/mandolin. Because of the number of strictly traditional Celtic bands around Brisbane, Bun' Ber E tried to make things different to suit their unusual backgrounds and line-up. This included playing the bagpipes with bass guitar, church organ and bongos for backing. The band soon found extra work entertaining patrons in the Club on Friday nights and then playing at weddings and parties. Soon they found themselves playing as "paid buskers" at craft markets and Southbank. 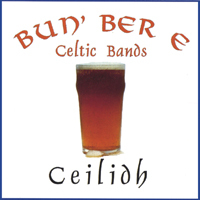 After some lineup changes and four years of people asking about a CD, Bun' Ber E recorded Ceilidh at Murdifications Studios in a single weekend in December 2000 and released it for sale in January. The band tried to focus on up-tempo traditional tunes played in non-traditional ways, and the initial run sold out faster than expected, with support from Celtic community radio programs and the ABC. The songs were recorded as a group initially, with Trevor, the 13-year-old son of the Flute, whistle and bagpipe player, Malcolm, playing Bodhran on some tracks. Bass guitar, percussion and vocals were added later. The only constant was Andrew's keyboards, which needed no overdubs (clever boy). Reviews in the home of piping led to Ceilidh being one of the few foreign recordings featured on the wall at the Piping Institute in Glasgow, Scotland. It also proved very popular among the local Highland and Irish dancing communities, and was added to the Australian Screen and Sound Archive. When sales exceeded expectation, Bun' Ber E were persuaded to make the CD available to a larger audience through the Internet. A very strong first album with plenty of bang for the buck. This is a debut album from a band who didn't expect to be a band. You might expect a bit of hesitancy, and a reliance on traditional sound to cover a multitude of sins -- but instead, Ceilidh adds modern muscle to tradition, delivering a big, bold and unorthodox sound from a bunch of lads who clearly enjoy their music. The album a fine, strong, braying bairn, kicking up its heels from the first notes on the whistle in the Rights of Man right through to the final medley -- a delightfully Australian placement of tongue in cheek that sees "Eine Kleine Nachtmusik" turbocharged for the bagpipe. African drums are mixed with more familiar Irish instruments, backed by solid keyboards, and punctuated with lusty vocals. The playing is clean, sharp and fast (especially on pipe and whistle! ), the arrangements are meaty but uncluttered, and the voices are right for the job. It's an unashamedly feel-good, kickupyerheels and dance sort of collection, yielding to the sentimental side of Irish music only in the well-rendered "Fields of Athenry" and "Spancil Hill." There are plenty of standards scattered through: "Drowsy Maggie", "King of the Fairies", "Blackthorn Stick" and the "Tenpenny Bit" will be familiar to any session player or Irish pub aficionado. As a result, the whole collection has a comfortably familiar feel to it, despite the unusual - but effective - arrangements and instrumentation. In fact, if there's a drawback to the album it lies in the reliance on favourites. Bun' Bere E have a distinct sound all their own which lifts the old tunes very nicely, but there's no originals on Ceilidh. One hopes that with the next cut, the boys will push the boundaries a little, and perhaps add something of their own for the next generation of folkies. Every track is great but Fields of Athenry is fantastic. Hurry and make some more CD's. The CD is absolutely fabulous - brilliant. We play it constantly at work. CEILIDH has great music for highland dancing teachers. It has both traditional and very contemporary pieces that would be a great challenge for any teacher wanting to do some choreography.